Taylor's meds were changed two weeks ago and we got to enjoy the effects as his body adjusted to the new dosage. Five days of no seizures and watching Taylor laugh, giggle and show off his new deeper voice with some good guffaws. The best was when he would laugh at the appropriate place taking us all by surprise. Christmas Eve he started having seizures again and the laughing has died way down. But it is still better than it was before the meds changed. We tried catching it on video several times but never could quite get it. But I did catch the end of one laughing spell. Monday we enjoyed our neighbor's open house. They throw a big party every Christmas for their neighbors and friends and put out tons of treats. So we eat a bunch of fudge and visit while kids run wild. I think its a wonderful idea, instead of doing neighbor gifts. Speaking of which, I did not do neighbor gifts this year while our counters and cookie jars literally run over from friends and neighbors dropping something by. I feel like I need to stand up in church and apologize for my lack of gift giving. We did work, church callings, teachers etc and then I was done for the year. Overall, we have tried to do less year and hopefully enjoy it more, which I think has worked well overall. And having only one dessert instead of three or four for Christmas worked just fine. Spencer and Allison had school Monday and Tuesday as they get out a week earlier in the spring than the other schools. Tuesday morning we woke up a little later as our electricity was out due to a huge snow storm. So we got ready by flashlight while Jeremy scraped the driveway. Then he followed us in the truck as I drove everyone to school. I was a little stressed as I was helping with both Spencer and Allison's Christmas parties so I had the stuff and organizing part of that plus I was bringing Taylor and Robyn with me plus I didn't get up super early to get a jump on everything as planned. But I don't know why I worried as all the other moms were there doing their parts and everything worked great. Robyn enjoyed eating waffles and doing crafts with Allison and then eating waffles and sewing surgical dolls for Primary Hospital with Spencer. 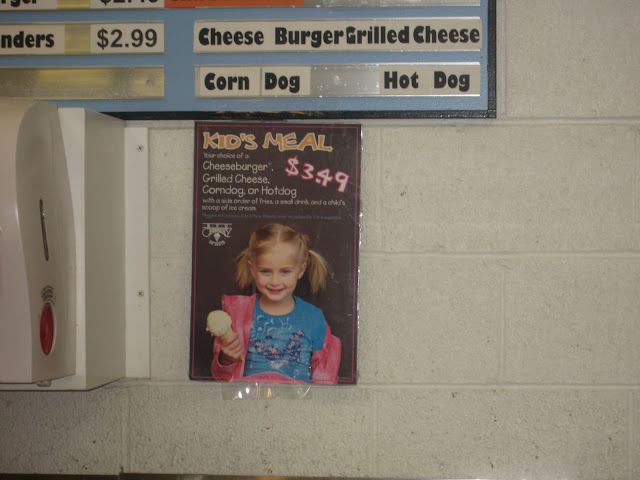 None of the kids needed lunch that day. 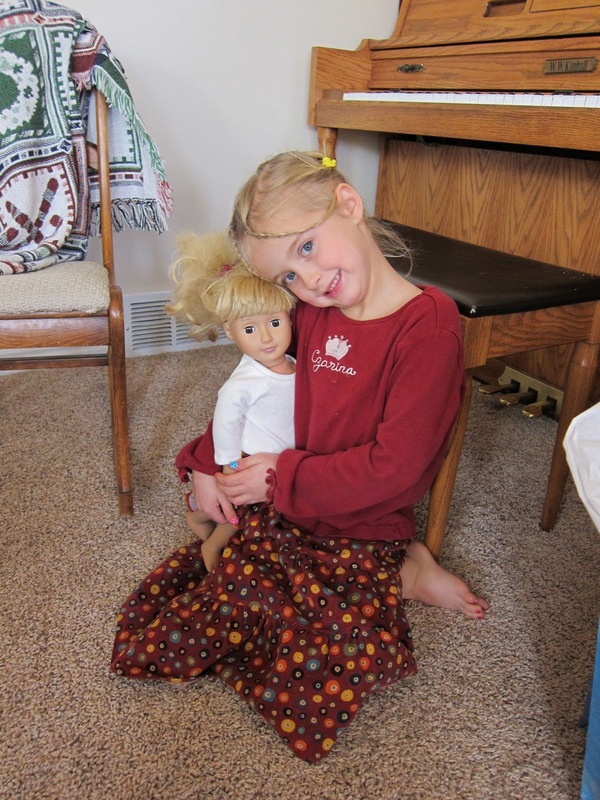 Robyn is on the posters for BYU kid's meals. They took her picture last year but I never knew they actually used it. We all thought it was neat. Jeremy's nail products first print came this week so he has started selling them online. That has led to a bunch of work and coordination on his part. I just get to enjoy the fancy nails. And he is getting everything put together on the photo studio co-op and took us over to see it. Right now its just a big warehouse with closets but next week it becomes the professional shooting studio. For Christmas Eve we met Jason and Kelly and cousins at the ice skating rink. We have done this for a few years and I love it. Kids are so excited and bouncing around that if we didn't go somewhere to blow off steam I think I would loose it. Santa drives the zamboni and Christmas music is playing. Spencer lost it a bit and it made me wish that they had special holiday/vacation bi-polar medication - it would make life so much easier. But he figured out how his ice skate should lace/feel and was able to enjoy the process. 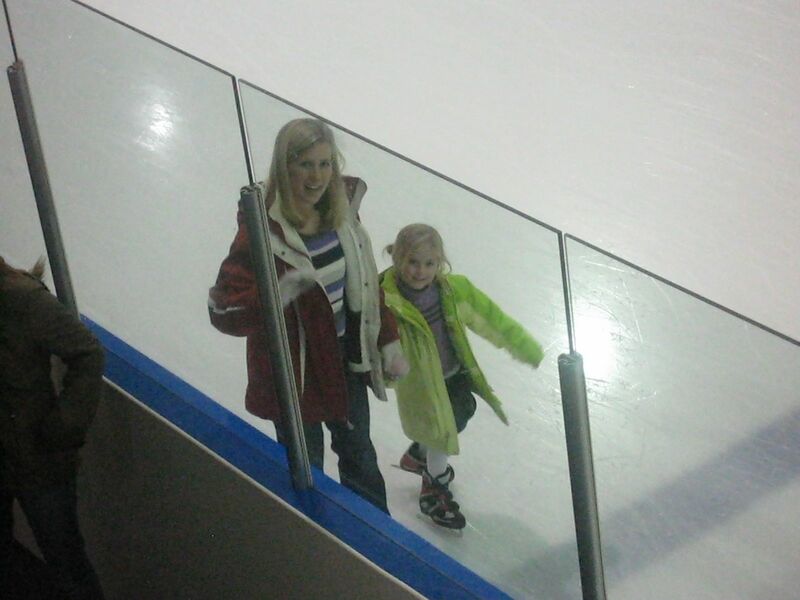 Allison had gone ice skating earlier this week for a birthday party so her skills were all warmed up and she was doing laps around us. 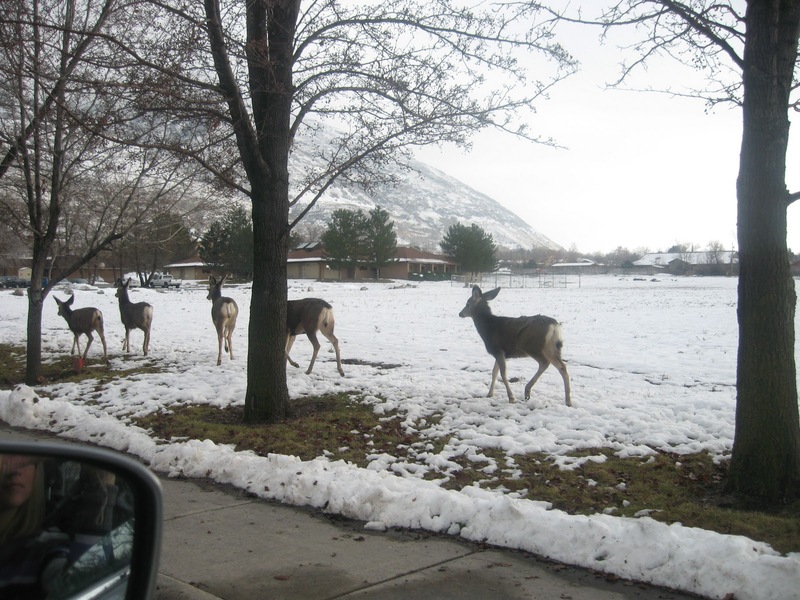 On the way to the rink we met a group of deer. Robyn kept talking about seeing Bambi. Then we returned to our house for nachos and to watch Its a wonderful life. Jeremy taught our kids a few years ago that Santa gets tired of cookies and would appreciate nachos. Santa has left notes confirming this theory so now the tradition is set. Our kids managed to contain themselves till 7 on Christmas day. And then they waited some more as I got Taylor ready. Jeremy had a small accident where he dropped his camera and his lens shattered so we waited some more. But our Christmas prayers were answered as it was only his UV filter that broke and not anything else. Christmas was a laid back affair with everyone happy and excited over their presents. It wasn't really a toy year as kids had asked for things instead. Jeremy disappeared for long periods of time as he enjoyed his new ipad. 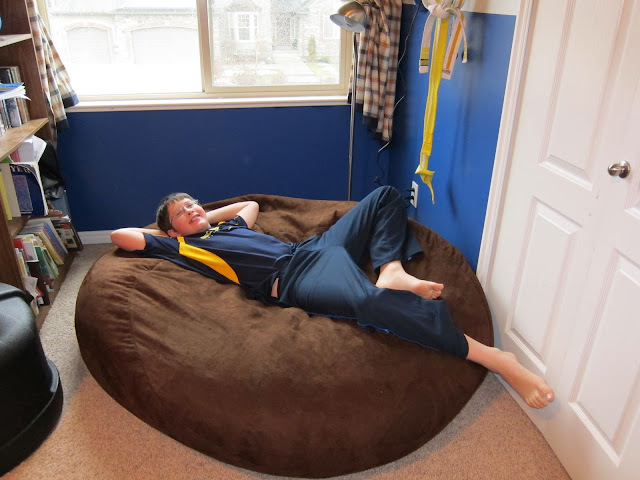 Spencer kept watching his bean bag expand with shouts of excitement everytime it expanded an inch. 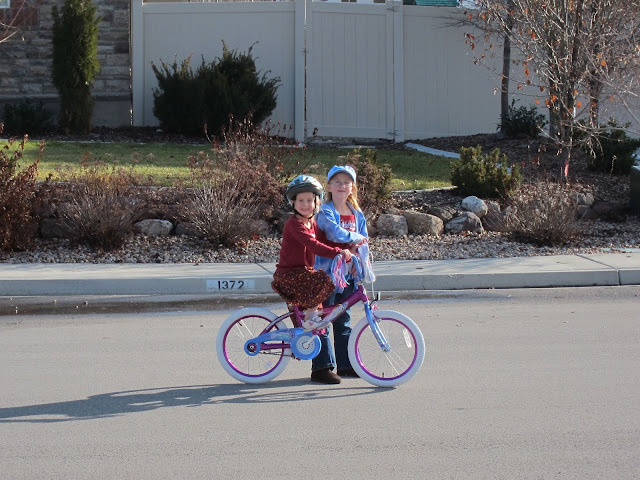 Allison taught Robyn how to ride her "big" bike. Jason and family came over that evening for dinner and presents and to play. It was just a wonderful day. 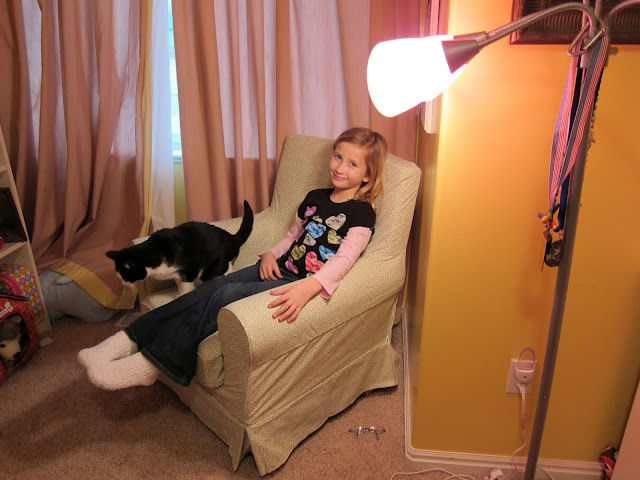 Allison fell asleep that night in her new chair, in her new PJs, with her pillow pet held tightly in her arms. I have decided I like having Christmas on Saturday as I can't clean anything up today and instead we are just hanging out and enjoying being together with new books, games, and left overs to keep us occupied. Hope you had a wonderful Christmas. Mickey has claimed Allison's chair already as her own. Spencer thinks he can sleep in his bean bag now. Robyn was so excited that her legs only bend a little bit on her new bike. On her old bike her knees practically touched her chin.